Hypnotherapy is a longstanding form of psychotherapy, dating back to many ancient cultures. Reference for example is made by the Chinese Traditional Medicine practitioner Wong Tai in 2600BC (cited in Jones 2016, certification training accessed 2017) to rituals and incantations similar to hypnosis. The ancient Greeks had “sleep temples”, Shamans used trance, as did the ancient Egyptians. It became a more formal “therapy” with the work of Mesmer and Braid around the 19th Century. It became a core psychotherapy method influencing Freud and his peers. Even after Freud (and Jung) abandoned Hypnosis, he chose to use free association, which any well trained hypnotherapist or NLP practitioner would recognise as working in an altered (partially hypnotic) state. Both essentially continued using a formal attention based and hypnotic process, by another name. In many ways hypnotherapy is the fore-runner of modern psychotherapy. Whether free association, dream interpretation, mental rehearsal, imagination and role play, ink blot images and interpretation, formalised conversation, language manipulation, these are altered state based processes. Hypnotic language and modelling of narrative does not need a formal trance, and can be used within psychoanalysis and psychotherapy sessions to focus, gently challenge and to direct the client to recall, consider or reflect. It might also be used to assist the client in reinforcing their choice of new behaviour or outcome, perhaps leading from a CBT process. Naturally hypnotic language can only be used ethically within a consenting therapy partnership, and only to empower the client. Formal trance is not required. It is often referred to as conversational hypnosis. According to Lynn, Kirsh & Halloquist (2008,p132 cited in Robertson 2013,p7) “The defining feature of the social cognitive view of hypnosis is a rejection of the traditional view that hypnotic experiences require the presence of an altered state of consciousness“. In formal trance, a state of focused yet relaxed awareness, hypnotherapy can take a number of forms, including suggestion, regression, visualisation, analysis and story telling. Because the mind is focused on fewer variables, and the client is relaxed and calm, the unconscious mind becomes easier to influence, and this can lead to consenting changes in perception and behaviour. Where the formal process is wanted outside of the context of hypnotherapy (for example counselling), this is often referred to as “mental rehearsal”. Because this is in fact hypnotherapy, the counsellor or other therapist should have formal hypnotherapy training for full safe effectiveness. It should be noted that “hypnosis” is simply the state of relaxation used, and this is the same basic state as meditation, deep prayer or listening to very relaxing music. “Hypnotherapy” is the process of using that focused relaxed state for psychological therapy. Everyday absorbing events are naturally hypnotic. Adverts, films and story lines are deliberately hypnotic. We enter hypnotic states of focused attention regularly. During hypnotherapy the client remains in control and can hear everything that is said to them. It is a consenting therapy partnership. Deep trance is not required for general hypnotherapy, and only a light state of relaxation is required. Indeed many NLP methods use only the lightest state of relaxation known as “altered state”. Any state of hypnosis is a form of monoideism: the focus of attention of the mind on a single idea. Entertainment type use of hypnosis focuses on drama and trance and follows the work of Mesmer, an occultist and stage artist. Medical and clinical use of hypnosis and hypnotic suggestion instead is based on the work of Braid, a clinician. Braid was a physician who coined the term “neuro-hypnotism”, later calling it a “monoideo-dynamic” model. According to Braid (1855, p81 cited in Robertson 2013,p31) “This term literally denotes the seemingly automatic or reflex-like (“dynamic”) power of focused attention on a single (“mono”) train of thought or dominant cognition (“idea”) to influence a wide range of behavioural and physiological responses”. Importantly therefore in clinical use of hypnosis, psychotherapy processes are used in a state where attention is carefully focused. It is absolutely not a state of magic or sleep, in fact such a state, as is used in entertainment, is not conducive to most therapy processes. At a CNHC regulator meeting in Edinburgh on the 13th March 2015 the regulator representatives acknowledged that counselling and analysis are key job functions in the provision of hypnotherapy, and delegates commented that hypnotherapists usually provide psychotherapy and counselling as part of their hypnotherapist job function. Hypnotherapy can be used as a primary therapy in treating the patient, or as a tool in the psychotherapy tool box. If using CBT or psychoanalysis for example, the therapist might then use a session of hypnotherapy to help the client action changes agreed during previous meetings, perhaps to break impasse or improve momentum in overall therapy. CBT self analysis is particularly useful in producing information that can then be used to design hypnotherapy sessions, thus directly channeling the feedback from the client into a change process to help them achieve their own chosen ends. As a primary therapy hypnotherapy is useful for psychosomatic disorders such as Irritable Bowel Syndrome (as recommended by NICE) and anxiety (as recommended by Anxiety UK). It should be noted that “psychosomatic” means conditions that are very real, but are generated psychologically. It should not be used as a dismissive term. Hypnotherapy is also widely used for phobias, self confidence, stress management, relaxation, self improvement, public speaking, performance, sports hypnosis, body image and changing habits. Indeed hypnotherapy is an extremely flexible tool which can be used in a wide range of cases. Flammer & Bongartz (2003, cited in Robertson 2013 p15) carried out a meta analysis of 57 high quality randomised controlled trials of the use of hypnosis. Overall positive results were identified in a wide range of conditions. Anxiety stood out, but also included were Tinnitus, Insomnia, Duodenal ulceration, Enuresis, Asthma, Warts, Irritable Bowel Syndrome, Chronis and recurrent headaches, Hypertension, Smoking, Test anxiety, Post Traumatic Stress Disorder, Anxiety, Quality of life and care following surgery, Post operative vomiting (after breast surgery), Blood Loss / pressure in maxillofacial surgery, Analgesia during labour, Osteoarthritic pain, care of third molar surgery patients, healing process in bone fractures, local anaesthesia, post operative recovery (open heart surgery), analgesia / reducing unnecessary movement in ophthalmic surgery, improvement of postoperative course in children, analgesia in interventional radiological procedures, analgesia for invasive medical processes, distress / pain in breast biopsy patients, treatment of burn pain, procedural pain during burn pain, chemotherapy-related nausea / vomiting in children, pain distress and anxiety in children undergoing bone marrow aspiration, pain / nausea during cancer treatment, chemotherapy distress in children with cancer. It should be noted that many of these are MANAGEMENT of condition based and not “treatments”, and it is likely perhaps that it is partly stress and anxiety reduction that improves the patient condition. Cognitive Behavioural Hypnotherapy, or the use of Cognitive behavioural therapy methods in combination with hypnosis techniques enables the treatment of all those conditions that respond to CBT, but also using elements of hypnosis. Studies including Shoenberger et al 1997, Bryant et al 2005, and Kirsh et al 1995, cited in Robertson 2013 p16) all indicate a better efficiency or effectiveness combining hypnosis and CBT (cognitive behavioural hypnotherapy) than CBT alone. NLP or Neuro Linguistic Programming is a modelling tool initially developed by Bandler, Grinder, Dilts and DeLozier. It is not a therapy in of itself, instead it models “excellence” in various therapies and in linguistics. NLP models include a range of hypnotherapy based change processes. Although these are useful, a fully trained hypnotherapist and psychotherapist will have trained in more depth and over a broader area than someone with just NLP training. Who to choose as a hypnotherapist? 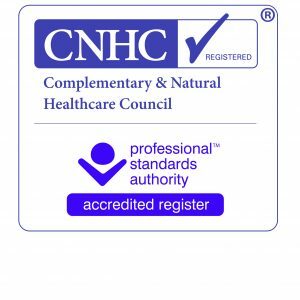 In the UK hypnotherapy is one of the complementary therapies subject to voluntary regulation by CNHC, the complementary therapy regulator set up with UK government funding and support. CNHC is also an AR or approved register. AR’s are maintained by the Professional Standards Authority, for healthcare professionals not subject to statutory regulation. It is also recommended that if seeking a therapist for a complex, deep rooted or serious issue, that the client should consider a more broadly trained therapist. Some hypnotherapists are only trained in hypnotherapy and have no core training in other psychological therapies. A broader range of training means more flexibility and tools to help the client. Avoid anyone claiming to offer a “guarantee” of anything! All therapy works to help the client to help themselves. As we only assist the client, it is impossible, and unethical to offer any kind of guarantee! Stuart has core training in psychoanalysis, stress counselling and clinical hypnotherapy. He trained 1993-96 with ASM,(externally NVQ accredited and assessed diploma course and CNHC accreditation route via SSM). He was assessed on over 200 client cases (well over 1,000 client hours) and NVQ assessment was an integral part of the training to ensure externally accredited standards. Stuart graduated in 1996 with a Diploma in Analysis and Hypnotherapy, and an NVQ level 4 in Training and Development. Since then Stuart has trained CPD in multiple other models of psychotherapy and psychology, including completing a second Bachelors degree (psychology based) and a MSc Psychology. Robertson, D (2013) “The Practice of Cognitive Behavioural Hypnotherapy. A manual for Evidence Based Clinical Hypnosis“. Karnac Books.